The Malkjgiri Lok Sabha constituency, the biggest in the entire country, now gets the golden opportunity to stand as an example for good politics in the country. 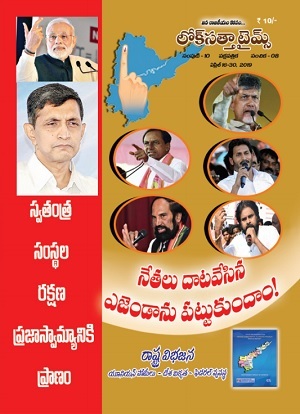 I appeal to Malkajigiri voters to elect Loksattta Party candidate Dr. Jayaprakash Narayan to Parliament so that he can work for the development of Hyderabad city and the two Telugu speaking States, creation of employment opportunities for youth and a set a direction for the country at this crucial time. I had the privilege of working as Director General of ‘Sashastra Seema Bal’, the second largest paramilitary force with one lakh personnel, Commissioner of the Twin Cities of Hyderabad and Secunderabad, Director of Andhra Pradesh Police Academy, Additional Director General of CRPF, Managing Director of the RTC and earning the Indian Police Medal for Meritorious Service in 1991 and the President’s Medal for Distinguished Service in 1998. I was Superintendent of Police of Prakasam district when Dr. JP was its Collector. If Prakasam district which stood at the 23rd place then in development now figures among the top five in the State, the credit goes to the direction set by Dr. JP then. When we see leaders minting thousands of crores in the name of irrigation projects these days, Dr. JP’s endeavours in the irrigation field in Prakasam district those days continue to be a matter of amazement. Dr. JP helped irrigate about two lakh acres at a cost of Rs.2000 per acre in partnership with farmers. There have been no instances of so much land being irrigated at such a low cost in the country 150 years after Sir Arthur Cotton. I have been a keen observer of Dr. JP’s work since then. He has been fighting indefatigably for ushering in good politics and basic reforms so that people can hold their head high and lead decent lives. 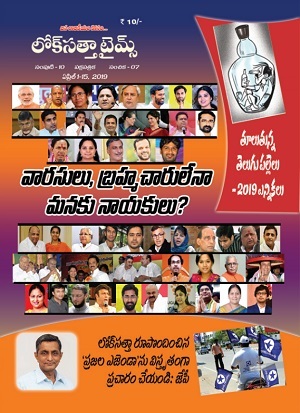 If people in Kukatpally constituency hailing from different regions are maintaining fraternal relations at a time when political parties are fanning animosities among people on the issue of the State’s bifurcation it is simply because Dr. JP has been its legislator. By respecting all irrespective of their party affiliations, he has enabled all of them to render yeoman service. Although he has had the distinction of promoting all-round development in Kukatpally by safeguarding peace and amity and without giving scope for corruption, he has refrained from pomp and publicity. As a legislator, he has acted to take care of the interests of all Telugu people. Being in public life for the last 34 years, Dr. JP has putting in extraordinary efforts in his quest to ensure that every child gets growth opprotunities without any discrimination. Dr. JP has enhanced the image of the State Legislative Assembly for the last five yeas and stood as a beacon for good politics. By electing him to Parliament transcending their caste, religion, region and party considerations, Malkajgiri voters should set an example to the entire country for good politics. Vote for the whistle symbol and elect Dr. JP, as he will enable all of us to win.